Do you enjoy having your feet pampered at your nail salon? Your feet relaxing in a soothing footbath? Leaving with your feet smooth, and nails freshly painted, to show off in those new cute pair of sandals you just picked up? Have you ever thought about how sanitary those footbaths are? While most nail salons clean out their baths between clients you have to wonder if they are being properly sanitized to get rid of potential harmful bacteria between each use. With Worry Free Pedi you know longer have to wonder. 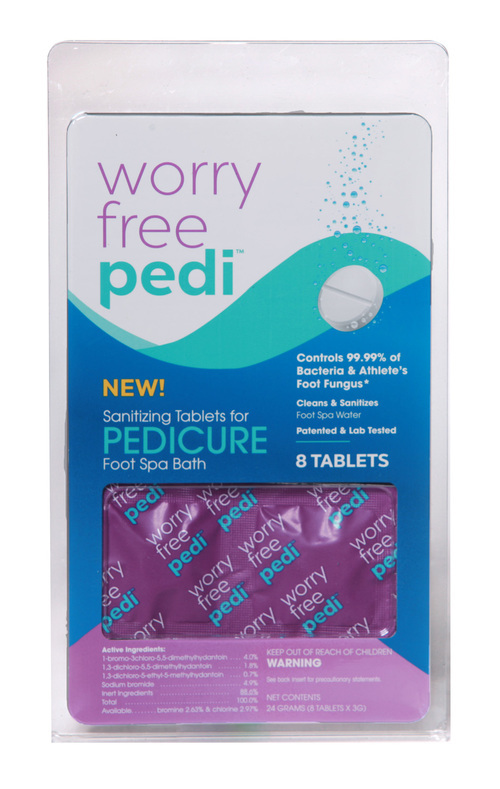 Worry Free Pedi Sanitizing Tablets are easy to bring along to your next pedicure appointment and they are even easier to use. You just drop one of these individually wrapped tablets into your foot bath water at your salon or spa, and within one minute the water your feet are soaking in will be protected from bacteria and fungus. You can even use it in your home foot bath when you want to relax those tired achy feet. 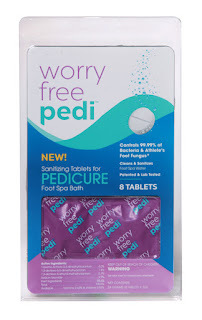 Worry Free Pedi is the only EPA registered spa sanitizing tablet on the market today. It is available in 8 packs online at walmart.com or at worryfreepedi.com. For those of you whose pedicurist knows you be name these are a must have! One Girly Girl reader has the opportunity right here, to win a pack of Worry Free Pedi Sanitizing Tablets. This giveaway ends on October 3, 2016. I will choose the winner using Random.org. Please leave a valid email address if t is not visible in your profile. US entries only. I have tired achy feet! I would be thrilled to win! My feet do need some pampering! I would love this as my feet are very dry and cracked this would be great. I would love to win and try this. i am so new to self care like this, this would make it sooo much easier! I want to win because my feet get so dry in the winter.